The name "Bakhita," which means "fortunate," was sarcastically bestowed upon this young child when she was kidnapped into slavery. After being taken to Italy and put into service as a nanny, she was sent to live with the Canossian Sisters in Venice, eventually becoming part of their community. For twenty-five years, she joyously carried out humble services in the convent, including taking care of the wounded during World War I. 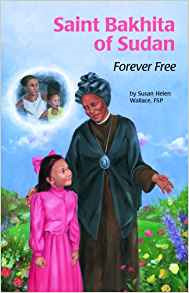 This African saint's engrossing life story, heroic choices, and forgiving heart make her a wonderful role model!